I am not often on this site anymore...and I used to, back in 2010, sit on pins and needles waiting for words of encouragments, anything to help get me motivated, lesson my anxiety and get me riding...just like the ladies I saw on the road. I needed inspiration. Nothing was a magic cure. Everything took coaching from people, courses, and baby steps forward. I took many courses, Beginners, Advanced and Advanced II training with cops. I took it all. And in the process, I rode and I rode and I rode. I would take rides, solo rides, to a destination for coffee...and I would be so anxious and nervous, but I did it. that bike, with raked out forks and 21" front tire, was a challenge. I had to change the bars and have it lowered and took courses with the Cops whom offered Advanced Training, in order to get comfortable. I dropped it several times, in low speed maneurvers, in the course, backing it up out of my garage...whatever. I just put engine guards on it...and rolled on. I then, bought a tri glide trike, so that I could take my daughter out, and hence, more modifications, beginning with handlebars and such. 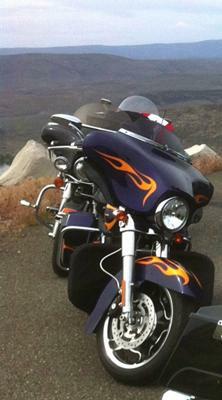 in 2012, I had a great handle on the softail custom. 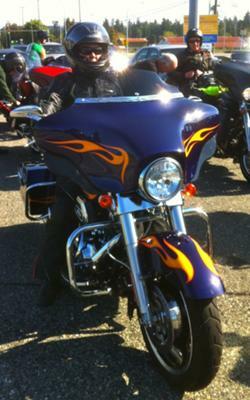 However, I attended a Test Our Metal harley day, and traded everything I had for a Street Glide - such was the ride for me. I thought I was going to cruise happily. Was unexpected that I would get such pain between my shoulder blades, and lower back, and than I would drop the bike in a parking - day 3 of ownership after a long day of riding. I was in misery. And, so, the feeling was much like a new beginner. I didn't want to ride, felt incapable, felt overwhelmed. I then talked to some ladies whom ride such bikes, and I stepped to it, got brave, changed the handlebars, mirrors, modifications to the seat to get me lower and closer to the tank, and put saddlebag guards, for the next inevitable drop. Everytime I came to a stop, I got anxious, and grabbed the handlebars tight, and the tank swayed, left, right, before I just managed to steady it..before it fell over. When you think it will...it will. After only having the bike for a few days after it received its modifications, I took it, because I said I would, on a 5 day trip into the US. I had to take ferries, I had to wait in long line ups at Customs, where I had to figure out how I was to slow maneuver it inches at a time forward until I could get through the 2 hour line up at Customs. I felt like a beginner all over again, not the 40,000 + km I had under my belt since 2010. Finally, exhausted and nothing to do but ride and get it done, I began to calm my over stimulated mind into relaxation. On the way back from Washington, we went over White Pass, and ran into such rain storms, snow, fog, Fast and Furious HWY traffic on the I-5 through terential downpours, I was so anxious but there was nothing to do but roll on, that I just tired myself out, and got "easy" with the new ride. I am about 5,000 km into my new Street Glide since May, and I have to say, I am so amazed at myself. I am very pleased. We have to be brave and throw our hearts over the fence, then go get it. How proud, the day, we rise and meet our challenge. A note to pass on, which was shared with me, when considering modifications to a bike. Warm regards....and hugs to all. Well on a good note the guy at the Harley shop replaced both of my handles for a mimimal price and didn't charge me labor to change them out. He also adjusted my clutch so it is not as far out to grab. I will be back in a parking lot tomorrow and I will definitely try your techniques. Thanks so much for the encouragement. There are two things that cause you to drop your motor at slow speeds. You are either getting scared when you are in a turn and sucking in on the clutch, or you hit the front brake while the front wheel is turned. Try this, go to an empty parking lot and from a stop place your foot gently on the rear break, ease out on the clutch and on slowely on the throttle, get up to a good walking pace, with your head straight ahead stop using the rear break only (keep in mind you are in a parking lot, on the road at highway speeds ALWAYS USE BOTH FRONT AND REAR BREAKS). Now when you master this, act like you are at a stop sign, from a stop, turn your head and look where you want to go, do the same techniques as above but make a turn left. Then stop keeping your head straight then repeat it to the right. Hope this helps. Being a newby rider, I so appreciate your story. I bought a sportster 883 and I think I have bought more than I can handle. I am getting an engine guard put on today, but I still am anxious. I have dropped her everytime I tried to ride on a rode. Can't turn at a slow speed. The last time I laid it down I got hurt; not bad but enough to scare me. Gosh but this is something I want to do. I just wish I had known more and gottena smaller bike. I am so pleased at the feedback that my story is enjoyed. Many of us, share various components of all our stories. The old slogan "Be, Do, Have"
If you want to be something or someone, if you can dream it, you can do it. But, first, in order to "have it", you have to play tricks with your mind a bit. If you can visualize it, you can "Be" it. Then, with this visualization of being fantastically great on 2 wheels, you "Do" it, with all the flair and confidence that you see of yourself in your vision. Then, with you "Being" it in your vision, and then with your "doing" it as you are in your vision, before long, you will "have" it...and you will have attained it. Parking lot..Ladies. Lots of parking lot work...before you head out....then go for a spin down some twisties, or whatever scares you, and take yourself to a destination...a nice coffee or somewhere. If you have a destination in mind, it makes the "doing" easier. Stay safe, push yourselves just a little bit every day, keep your eyes and heart in your vision of what inspires you and then step to it. Way to capture it all - the emotion, the triumph, the ongoing adventure as we all move forward and make progress! I have no doubt that your words resonate with many, many of us who check in with this site. You are an inspiration, and you made me smile today. Thank you. I often train with motor officers and challenge myself. One of the greatest things I learned was NEVER pull into somewhere you can't get out of. I took that to heart and now when I pull into anywhere I make a tight u-turn and park facing OUT! I'll never back out of a spot again. This also helps when I ride my husbands 2012 RK with the police seat. I'm 5'4 and can only put one foot down at the time. I just keep my Rt foot up at the stop sign and put my left down. This is another trick I learned with the motor officers. These two tips I learned keep the shinny side up. If you haven't seen the NEW RIDE LIKE A PRO video I rode with an amazing young lady in it named Victoria. She is 4'9" and any motorcycle you put her on even a Honda goldwing where she couldn't touch the ground on either side (the guys would hold it up and she would get on it and ride any course they threw at her, of course she would ride between them, stop and they would hold it while she got off) but that taught me another valuable lesson. Riding, Parking, and turning a motorcycle is strictly between the ears! I love your comment about the "valet parking!" I must remember that! The Super Reach Seat, or the Super Reduced Reach Seat, will lower you 2 " and put your closer to the bars. With your feet flat on the ground, or nearly flat, you can...even..back up a bike! A dyna is a super bike and I love it. I am a motorcycle junkie. I love them all. And unfortunately, the additional price we pay, is to get it modified to fit us. But, once that is done...hurray...time to ride and play! Thank you so much for your story. I too have traveled far and have had to over come the nerves associated with scaling up to a bigger bike. I've had the road king 6 months now and have put 5K miles on her. We are still getting aqainted. I had to put a reach set, new bars, lowering kits etc on her just to sit on her. What a great bike, the ride is wonderful. I've dropped her backing out of the garage and doing a low rpm turn in a parking lot. I've had a bunch of close calls at stop lights too. You just have to power through all that doubt to keep your knees in the breeze!! Just last weekend, I traded my beloved Sporty for a 2012 HD Dyna Street Glide. I picked her up on Monday, and rode her straight home, because the weather was threatening. I have been out of town on business all week and have not been back on her since. I have to admit to trepidation about taking my new Dyna out this weekend. The ride is so much smoother than my Sporty, and the range I will have with a 5 gallon tank will open up options for road tripping, plus, she's just so darned pretty, I am not regretting the decision to finally move up in bike after 4 years and approx 15K miles. It's just that the riding position is different. The bike is heavier, and I don't have both feet flat on the ground, so I am worried about coming to a stop on a slant or a hill. I am not over-reaching for the handlebars, but I am stretched out more than I was with the Sporty. I did have the dealership roll the bars back just a bit, but I am not convinced that the Reach seat wouldn't be a better fit for me. In other words, I am so glad you posted your story, because it helps to know that there are others out there who have gone through "growing pains" when moving to bigger, more powerful bikes. I will get over mine too, I am sure....and I had them put an engine guard on it before I left the dealership - don't want to scratch that pretty blue paint!! !